Tempera on paper, 85 x 64 cm (33.5 by 25.2 in). Signed. Inscripted by the artists hand with the title above on the reverse. Fine preciously framed gilded white. Dimensions with frame: 87 x 109 cm (34.2 by 42.9 in). Listed and illustrated work at the Catalogue Raisonné to the artist, together with the similar preparatory drawing. (see Hellwich/Röske 57/12 and 57/28). Significant and remarkable artist from the circle of the Berlin-Secession. Studied drawing at the Royal Academy in Berlin initially based on academic realism of Adolf von Menzel and Anton von Werner. 1905-1906 as pupil of Anton von Werner and Philipp Franck at the Royal Academic College of Fine Arts in Berlin. Mainly influenced by the French and German impressionism (Max Liebermann, Phillipp Franck, Max Selvogt, Lovis Corinth). His work belongs to the so-called "verschollenen Generation" (Forgotten Generation), which describes a generation of young German artists born between 1890 and 1905. Artists who didn't have the possibility of continuous working and neither to exhibit consistently, because their lifes and creation was influenced by the difficult circumstances of two World Wars. Mainly of the Nazi Regime, they became victims of the denunciation of '“Degenerate Art“. Their early work was often destroyed or torn apart and so they fall into oblivion. Until several newer publications and exhibitions, which reminded on their first successes, drawn a wide attention from museums and privat collectors to them. Recently many artists of this generation been revalued and continue to climb in value. They are also called „Expressive Realists“. His works can be found in important public collections including the museums and galleries Staatliche Museen zu Berlin, Preußischer Kulturbesitz, Nationalgalerie (Prussian Cultural Heritage, National Gallery), Märkisches Museum Berlin, Staatliches Lindenau-Museum Altenburg, Museum der bildenden Künste Leipzig and been regularly represented at main exhibitions in the years 1912-1960 including the Große Berliner Kunstausstellung since 1913, Freie Secession under administration of Max Liebermann and at the Berlin Secession under administration of Lovis Corinth. Literature: Vollmer, vols 3/6, p. 134/174; Roland März, Paul Kuhfuss, Maler und Werk, Dresden 1980; Paul Kuhfuss 1883-1960, Retrospective, National Gallery of Berlin 1983; E. Hellwich / Dr. P. Röske, Paul Kuhfuss, Catalogue Raisonné, Berlin 2000. Further reading: Rainer Zimmermann, Die Kunst der verschollenen Generation (Forgotten Generation), Munich 1994. Notes: ... 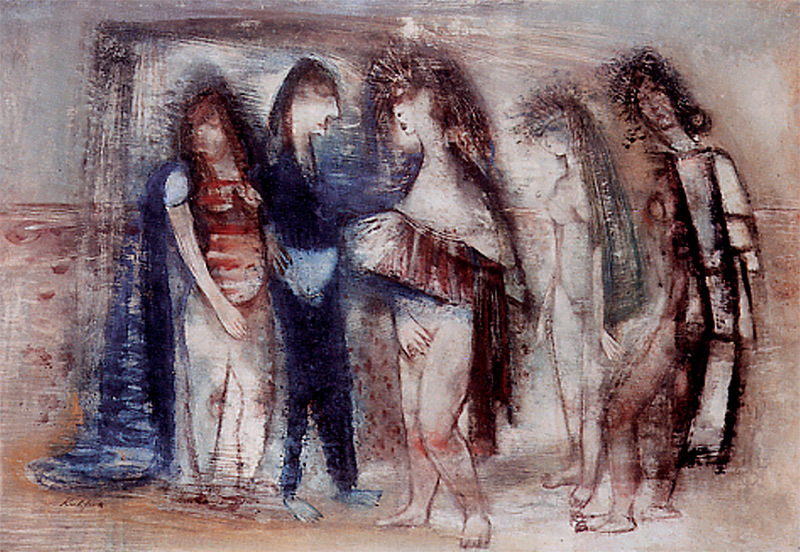 In the last years of his life he summarized his works stylistical and characteristical into eidetic reduced, magical and visionary landscapes with huge human figures, called „Strandfiguren“ (Beach figures), which to have symbolic significance in figurative sense and are timeless and unapproachable in their habit... Now he reached the peak of his creativity. The whole spectrum of his art... (see Mr Roland März, Paul Kuhfuss - Maler und Werk, Dresden 1980). The artist depicting desires, a male dressed in garish blue surrounded by four female figures, the one in his arm at the left, the one he adores at the center appearing Venus alike within the composition and a very young innocent beauty in white standing to contrast by an aged female dark coloured at the right, which symbolizes the evanescence of live. 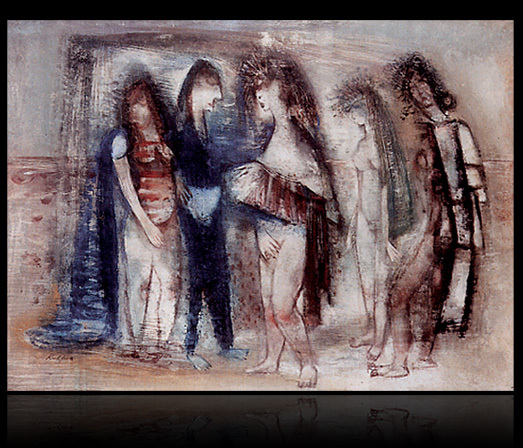 A incredibly gorgeous work with superb composition and subtle treatment of his in phantasmagorical aloofness characterized figures at the beach, which he thematized in the 1950s, a main and most important period of his creation. Excellent original condition. Further details and price on request.